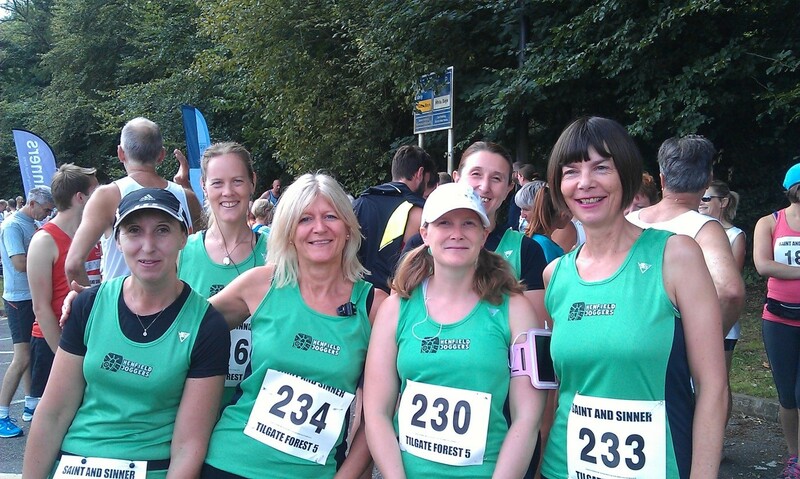 Some of us headed up to Tilgate Forest for the Saints & Sinners 5m Fun run this morning. Nikki, Louise, Lorna, Alison T and me. Nikki’s sister Louise and brother-in-law joined us too. Alan Barwick was also there, sporting his Team HJ’s running vest! (Sadly we didn’t get a pic)! It’s great that we can now easily spot members of our team and get encouraging shout outs from the Marshals! Go Henfield!! It was a lovely run, completely off road, through the forest trails and the conditions were just perfect. One or two little hills, but nothing compared to the Highdown Hike or Roundhill Romp that some had recently endured. Highly recommended for anyone tempted next year! Well done all – Go Henfield! Well done everyone, good running weather too!